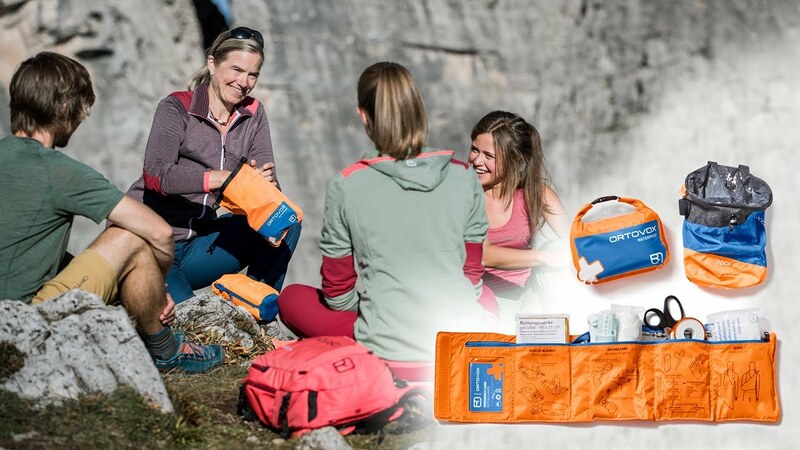 With our compact FIRST AID ROLL DOC first aid kit you are perfectly equipped on the mountain: The kit contents are neatly divided between five compartments. From the rescue blanket through gauze bandages and compresses to scissors or tweezers – in the FIRST AID ROLL DOC you have all important tools for delivering first aid. Illustrations and captions provide information on the contents of each compartment and the correct first aid tips. Because in an emergency situation, it’s not easy to keep a clear head. That’s why they give you important guidance when it matters. In the first compartment you will also find our ORTOVOX emergency card. This gives the first aider basic information for informing emergency contacts, making emergency calls and information about the accident victim. Allergies, illnesses, contact details and personal details are all listed on the emergency card. The first aid kit’s built-in loop ensures a good fit. This makes it easy to fasten to your belt. The first aid kit can be fastened to a belt using the BUILT-IN LOOP. The kit contents are neatly divided between FIVE COMPARTMENTS. ILLUSTRATIONS and CAPTIONS provide INFORMATION on the kit contents and FIRST AID TIPS.